Baby gets to an appropriate age for starting solid foods. Dear Renee – How do I start solids with my baby? I send out informational, easy reads for that mama to read up on. – to try some baby food veggies and fruits – maybe even organic. – to invest in a high speed blender to make her own baby food. – she doesn’t want to go the “mainstream” route of baby cereals as a first food after reading they can be toxic to baby. From about 6 months until 1 year old, baby is fed a beautiful rainbow of veggies and fruits and also some brain building avocados, coconut butter, or egg yolks or a few tastes of plain whole yogurt. Then life gets a little crazy. That once “go with the flow” baby is now an independent, choice seeking toddler. Everything goes out the window. What do you do when you can’t just pop a jar of baby food open? When that baby turned toddler wants to “do it himself”, eat what *you* are eating, and needs more to fill him up than breastmilk or a bottle? The answer doesn't have to be toxic cylinders of puffs, processed milk string cheese, and endless bowls of yellow noodles from a blue box, or bright orange O’s from a can. You've spent too much precious time over the last year introducing some great food options that can be taken from the baby level to toddler level and beyond! The transition can be easy – and even exciting for that little one that wants to feed himself! Take a look at what the whole family is eating. 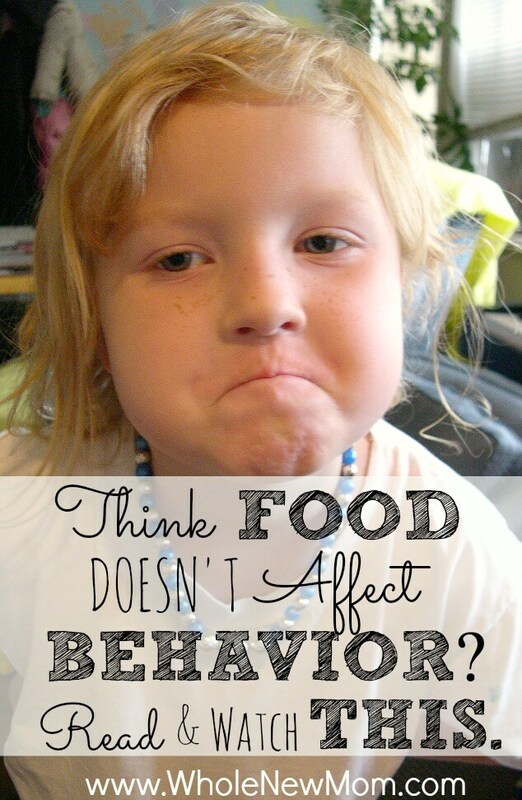 If family is eating junk, then toddler will naturally fall into that. Make small, babystep changes to cleaning up the family’s food – that way when he wants a bite of what you are eating – it’s a good thing! After my second and third girls were born, at about 10 -12 months I was basically just taking what we were having for dinner, blending or mushing it up, and feeding it to them, sans any grains. Easy as pie! If baby was eating avocado, egg yolks, coconut butter, etc. as a baby – he should be as a toddler too! Instead of mashing the avocado, try pieces as finger food – or make guacamole for dipping or to spread on a sprouted tortilla. My big girls will just take a half shell of avocado, and scoop it straight out on a spoon to eat. It's all in how you present it. I love avocado spreads and in tacos, but not straight up! BUT that doesn’t mean I can't try creating a better taste palate for my kids. If baby was eating yolks as a baby – try making him a scrambled egg or sunny side up! Spread coconut butter on a piece of fruit, or pancake/muffin as long as your toddler is digesting properly prepared grains ok. If baby was eating peas, squash, carrots, green beans, sweet potatoes, etc before toddlerhood…then he should be eating those veggies INTO toddlerhood! Just transition out of baby food form. Get a good steamer. Try sautéing green beans, or roasting squash. Douse the veggies in friendly fats (real butter, coconut oil, olive oil) and sprinkle sea salt and little pepper. Not only will the butter help the veggies digest and absorb better, it makes them taste good! Toddlers need minerals too – don’t be afraid of a little sprinkle of sea salt. The same goes with fruit – instead of mashing banana, try little banana pieces instead of toddler puffs. Applesauce works great. And if it’s summer, raspberries and blueberries are like natures perfect finger food! Use any meats you were already feeding baby. Likely a pureed form is easiest until a little closer to age 2 when all those molars are in. But don’t skip the meat just because you have to puree it to serve it. If dinner is well balanced and clean, pulse it a few times in the blender if it has some meat, and let your toddler give it a try. Fill those growing toddlers up. No time for frying up eggs every morning? Make a dozen hard boiled eggs for the week to grab and go. They stay good in their shell up to 5 days! Again – everyone should be eating about the same. If you can get up 15 minutes earlier, you could have enough time to fry up eggs and sweet potatoes for the whole family. Cereals are not only full of toxic processed grains, but they aren’t filling. Make a large pot of soaked oatmeal (or this oatmeal cake) on the weekends and warm up the leftovers throughout the week. Serve with hard boiled eggs or bacon and raw milk or coconut milk. Make a several batches of a quality gluten or grain free muffin or pancakes. They can come straight out of the freezer into the oven or toaster and be served with coconut butter, nut butter, or butter. Homemade granola can take the place of boxed cereal for those that really miss it. And who says veggies can’t be served for breakfast?! My girls regularly ask for squash in the morning – easy! I rely a lot on soup for lunch. I make large batches to freeze so they pop out of the freezer for easy meals. Dinner leftovers make great lunches too. We are a gluten-free house so I've gotten creative with “sandwich” making since gluten free breads are mostly junk ingredients and super expensive. 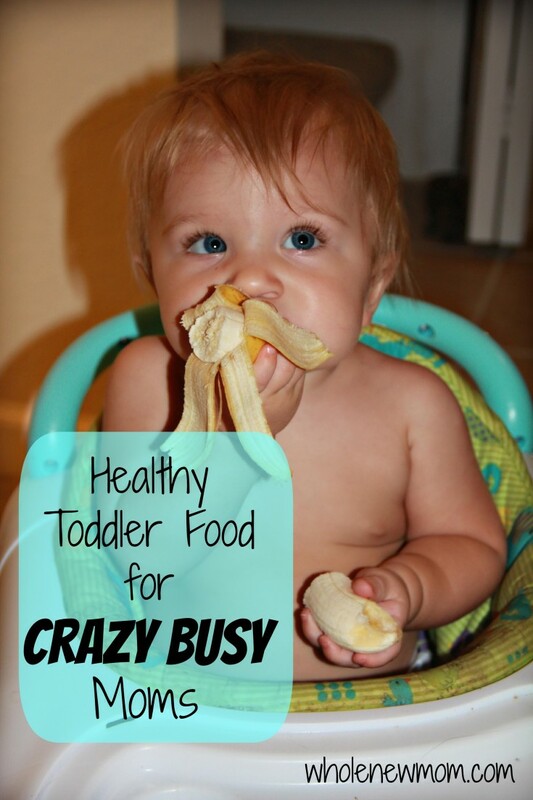 – Nut butter sandwiches on apple rings or celery sticks for older toddlers that can chew well. 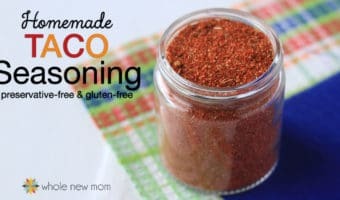 – Sprouted refried beans on tomato slices for littler ones. – My girls were able to chew lettuce leaves and cucumber/zucchini “boats” or rings by age 2 so I load them up with chicken salad, sprouted refried beans, guacamole, etc. Whatever YOU are making, they should eat. I’m not a short order cook. Having a toddler is a great way to get your thinking toward feeding *yourself* in a clean, real food way – little eyes are watching and they'll be eating exactly what you do when they are in the toddler years. Too Busy for Healthy Foods? Life is crazy with trips to Gramma's, daycare, homeschooling, and other bopping around town. How can you get away without the jar of convenient baby food? Planning is the key. Roast a whole squash to eat throughout the week. Steam a huge batch of a mixture of different veggies to use over a few days. Get a whole chicken in the crockpot and use leftovers throughout the week. Use old baby food containers to make yogurt cups with a few pieces of frozen fruit that will thaw out on the bottom for grab and go meals. Make them part of it! What?! Doesn’t letting a 2 year old “help” you in the kitchen make it a *much* longer task. YEP. But not forever. My almost 5 year old can make her own snacks (including making a healthy choice of what to have). She's been helping me in the kitchen since at least 2, and now at age 5 I can trust her to stir a pot of soup, use a butter knife to spread her own butter, or cut up some raw cheese, or clean a bowl of vegetables in the sink. Get them involved to help move things along in the long run. The first half of the battle is that 2 year olds go through spurts of not requiring as much food, and then will go a few days of eating you out of house and home! Don’t take non hunger as being picky. They will eat when they are hungry! I've often packed up a “picked at” lunch, and she'll eat it later in the day when she's hungry. I don’t offer snacks or something different. Period. My girls have gone to bed without dinner multiple times – I offer their “picked at” dinner right before bed, and sometimes they will eat it and sometimes they won’t! And they are still alive and happy in the morning! I don’t force them to eat. That creates a negative feeling about food. The other half of the 2 year old battle is learning independence. I set the stage very young that this is what is being served and that is that. I do however listen to their bodies. I'll find my 2 year old with a fist full of butter, I whole heartedly let her have it, but then make sure the next meal is full of healthy fats since her body is craving it and needs it. My 4 year old recently went almost an entire week of requesting an avocado EVERY DAY…she ate an entire avocado everyday for a week! But she was growing and literally within a couple weeks of that she was into a different size shoes and clothes! Most of the day’s meals are very planned out and they eat what they are given, but I do make them a part of meal planning here and there. Ask : Do you want broccoli soup or cabbage soup? Meatloaf for dinner or tacos? Do you want eggs or bacon with your breakfast? Guided questions still make them feel they are getting to voice independence. I'm not in that boat yet. 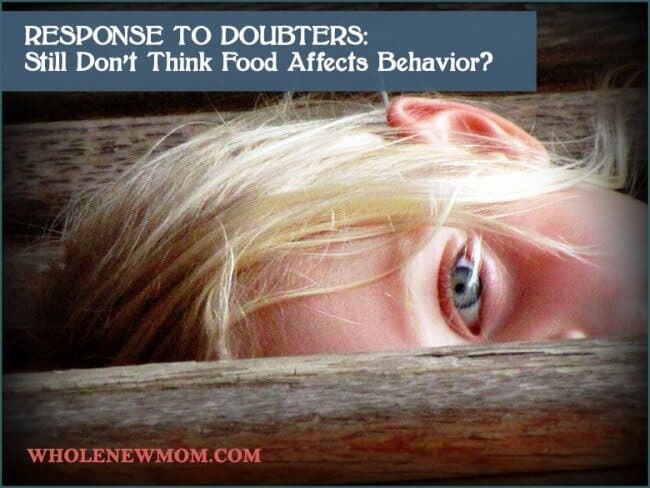 Please feel free to share how you helped your older child that may not be used to a real food diet, into this way of eating. I would love to learn too! Got any Tips to Share for Feeding Your Toddlers Whole Foods? Renee is a wife and mama of 3 busy bees under 5 years old. After struggling for years with gut and food allergy issues, she has been able to heal, and is passionate about raising the next generation of kids with a better understanding of how food affects their bodies. She is committed to teaching others that simple, real food can make positive changes in health and can be done on a (very) tight budget, all while making the kids smile. Renee blogs at Raising Generation Nourished and can be found on Facebook, Twitter, Instagram, and Pinterest. I’m going through a very picky phase with my daughter since she was about one and she is now 20 months. I really have to learn to not give her anything else if she doesn’t eat what I give her. I admit I have been catering to her abit by offering other foods when she doesn’t eat her main course just because I’m worried she will go to bed hungry. Thanks for all your great tips. You are so welcome. Sorry for not responding sooner – I have a lot of comments that got lost in a pile. Thanks for reading! Great tips for those of us who are always on the go! Love it! I know that for us, it was always crucial to make sure that *I* was eating healthful foods! Kids are DEFINITELY imitators! The other big thing for us has certainly been exposure. They’ve been offered blueberries five million times. Guess what they LOVE to eat? Blueberries! I’ve also offered them cherry tomatoes frequently. They get so excited when they see tomatoes, it’s ridiculous. You’d think they were candy. I love seeing my little ones love healthy foods!